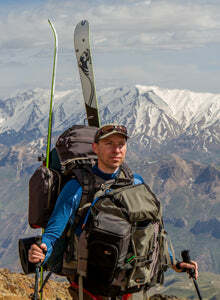 Lars Larsson, expedition leader for the Sven Hedin Project tells us about the expedition to Iran, which is part of a larger project in which he does a series of expeditions to Asia in the footsteps of Sven Hedin. "Following Sven Hedin's route from 1906, over 2000 kilometers through the eastern Persian deserts we had the opportunity to compare and document the landscape and culture of Iran and how it has changed over a century. It was an amazing experience to travel through a country with such a rich history and the people we met along the way probably gave us the most memorable moments. Iran is a country of many contrasts and it was incredibly fascinating to experience everything from snowy mountains to fiery deserts, lush oases and sterile deserts. We also got to see the wealthy district in northern Tehran and face extreme poverty in rural areas of eastern Iran." How long did you spend on planning the journey and how long were you away? The initial idea for my Sven Hedin project was born six years ago and the first plans for the Iran Expedition started to take form about three years ago and intensified in the last year before departure. The expedition lasted six weeks in Iran. What was the most important to have planned before departure? In our case, the most important task during the expedition was to locate the camera positions that Hedin had used when he took his photographs. The goal was to find these and take new pictures from the exact same place in order to compare them with the historical images and thus identify changes. Therefore it was very important to keep track of which camera positions that would be possible to retrieve and approximately where they were located. Could you have planned anything differently now that you know what you know now? A difficult balance we constantly had to battle was how to prioritize between trying to follow Hedin's route as closely as possible or to take time-saving shortcuts that would make it possible to spend more time in the areas of importance. In hindsight, I might have chosen to concentrate our efforts on fewer sites and skip the less interesting parts of the route. Everyone in your team seem to be experienced guides or similar, would you say that this is necessary for an expedition like yours? It is absolutely not necessary that everyone in a group is experienced, but it's obviously a big advantage if at least someone is. Our Iranian team members were experts in off-road driving in the desert and without them it would have been unthinkable to cross Iran's central salt desert. Also, Mount Damavand that we ascended is nothing one would do without experience of the mountain. But the rest of the journey, anyone feeling up for the adventure would have been able to do. Photo: Adrian Nordenborg. The team on their highest camp on Mont Damavand. From the left: Johannes Widerström, Stefan Pettersson, Lars Larsson, Adrian Nordenborg, Mehrdad Ghazvinian, Babak Ghazvinian, Daniel Warberg. What are your top tips for someone who wants to do something similar as the Sven Hedin Project? Get a good interpreter and a good driver if you want to be able to travel off the beaten track. Also, try to learn at least the simplest phrases in Persian because it often enough with a few words to make contact with the locals. The highlight was when we were in the picturesque desert oasis Naibend when we, by chance was invited home for tea at the same property that Hedin had photographed 107 years earlier. We got to talk to five Iranian women of different ages at the house, which was great fun as women up till then had been absent during the entire journey. The worst thing about the trip was that we were always afraid to offend the regime in Iran. During a single day at the end of our trip we were stopped a total of eight times by police and intelligence services. What did you think when things did not go as planned and how did you solve it? One thing that went wrong was that we were originally going to try to cross the Iranian central salt desert by camels. Unfortunately it turned out that almost no one uses camels for riding or transporting animals anymore. The only person who had trained camels with saddles, refused to comply with us and claimed it was impossible. We spent a few days in the search for any other big camel owners in the neighborhood that would want to rent camels to but none of them had the experience or equipment required. It was a difficult dilemma but we finally took the correct decision with regards to the particular safety of the animals, to refrain from the camel crossing. The solution was to use cars instead, which was not an easy task, although in the end it became very successful. How did you finance the trip? The expedition was funded by the National Geographic Society, which is one of the largest nonprofit organizations that support research and education. I am very grateful to be working with this amazing organization and without them the trip would not have been possible to implement. What was your cooking equipment like? We used the Primus OmniLite Ti stoves. These are great for mountain climbing with its light weight. Moreover, it can be difficult to get hold of clean fuel in countries like Iran and then these stoves are perfect, as they worked just as well on the extra crude Iranian gasoline. 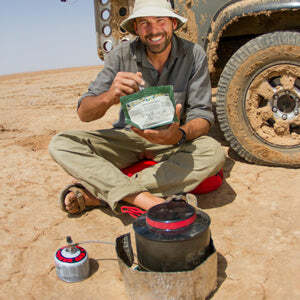 For the stoves, we mainly used three-liter Eta pots for melting snow, since we ate dried food from the 24 Hour Meal. You can read more about the Sven Hedin project on their website.